New solicitation and cover artwork for Archie’s Mega Man #12 is live, which intends to cap off the Mega Man 2-inspired story arc, "The Return of Dr. Wily." The cover, alone, is enough to make anyone want this issue instantly! But alas, we have to wait until March 2012. "This is it, the grand finale of “The Return Of Dr. Wily!” Dr. Wily has hidden himself in his latest fortress and surrounded himself with killer robots as he plots his counter-attack. 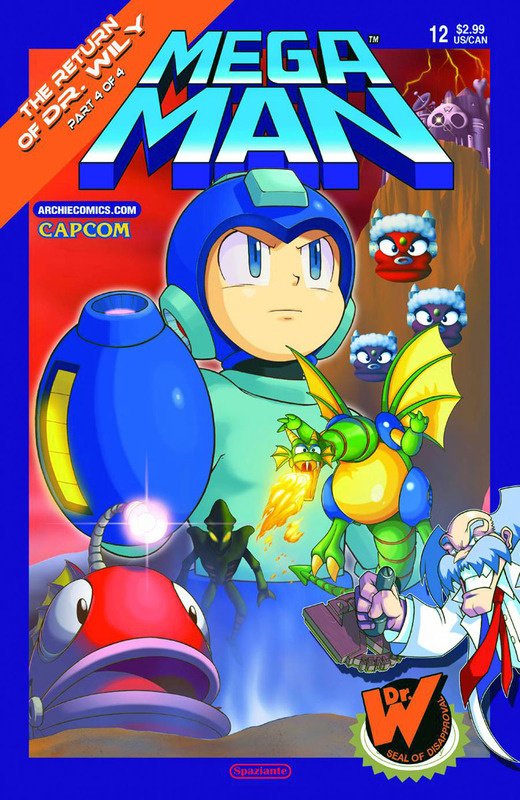 Can Mega Man breach the defenses and stop the mad scientist in time? Maybe not alone — but the Original Robot Masters have got his back! It’s all-out robot warfare in the explosive conclusion!" ---- 32 pages, $2.99. Well fancy that... the cover art is a reinterpretation of the European Mega Man 2 packaging! Quite the improvement, wouldn't you say? And really, Dr. Wily’s “Seal of Disapproval” is just the icing on the cake. Splendid work on behalf of Patrick 'Spaz' Spaziante! That cover is the bomb. 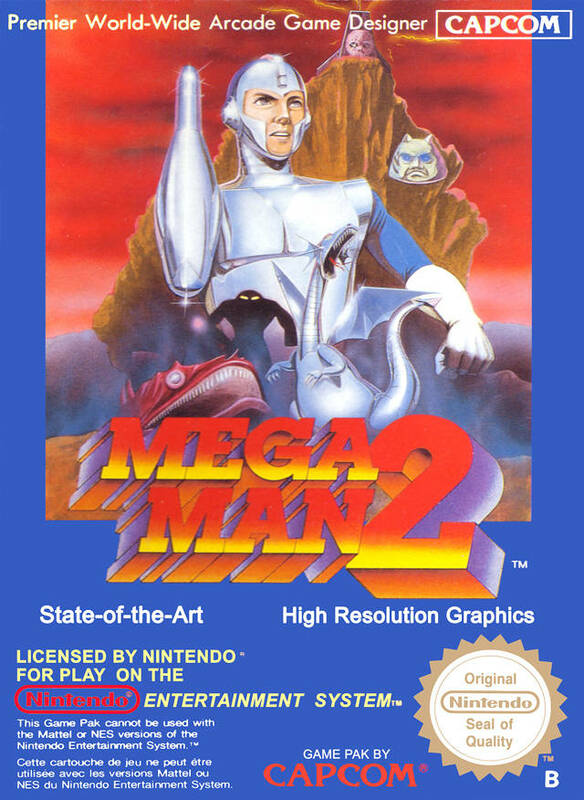 It’s like the ultimate tribute to Mega Man 2. I mean, not only is it Spaz, the fact that an artist actually cared to do a bit of research and tribute the European cover is amazing. God, Spaz is awesome to heck. Though I have to ask: Did that fish, that alien and the 3 heads ever show up in the game itself? I’m curious; I never played MM2 to the end. i don't remember the alien and 3 heads, because i didn't play the game much, but yes, that fish does. Fish i think was Bubbleman, heads were platforms on Airman's stage, and the Alien is during the final boss segment. Won't it be until April 2012? Issue #8 just came out this month. The "alien" in the Euro cover is probably Airman, IMHO. This is probably the best of the covers so far. Wish they had done this for MM1. The fish is a miniboss in Bubbleman's stage, the heads are hazards/platforms in Airman's stage, and the Alien is the Final Boss. What is it with comics these days and their four-issue mini-arcs? Seriously? Boom Studios does it with their Disney Afternoon comics, too. Also, I have to admit. That cover is boss. Joseph: Did it with their Disney Afternoon comics, you mean. It lets them make trade paper backs easily, as those tend to be four issues long. That's damn cool. I was talking the other day to my friend at the local Books-A-Million. I noted how of all the comics on the rack, only the MegaMan #7 cover stood out. Among all the redundant Spiderman/X-Men/Batman titles and all their grim, dark, abstract stylings, none of them really reach out and catch your eye like MM#7. I would think the art of designing an appealing cover would be mandatory for working in the comics industry but it's really diminished over the last generation. Thank God Spaz still has the talent to design a wicked cover, because that kind of visual appeal can only help bolster attention to this book.